Aaron Williamson, a consultant in Toronto, recently published a fascinating model of the community aspects of identity as the first step towards developing a theory of community formation. The model so far is explained on his blog and I’d recommend you read his excellent, short article before continuing reading this. Aaron acknowledges that “a community or potential community is a complex system” and that “community itself is an emergent quality — community, per se, does not exist; it is a perceived connection between a group of people based on overlaps of intent, identity, interest and experience“. These four aspects of our ‘selves’ are shown as green circles, above. Elements of each aspect are shown in orange circles. His argument is that if we can achieve a reasonable understanding of these four aspects of our selves and see how they overlap with those of others in the group, we can ‘form’ more effective, better connected communities. Aaron has created this model for use with business clients (like me, he’s an alumnus of the E&Y/Capgemini Accelerated Solutions Environment process for tackling challenging business problems). As such, he has, I think, either unintentionally or deliberately omitted the messy aspects of our identities and our ‘selves’, the emotional and subjective aspects businesses would mostly prefer you leave at the door when you report for work. This omission may make the model more palatable to business clients, but I believe it significantly weakens the model and its value in facilitating better communities. Similarly, the aspect of our ‘selves’ that Aaron calls experience is, I think, better described as ‘capacities’. 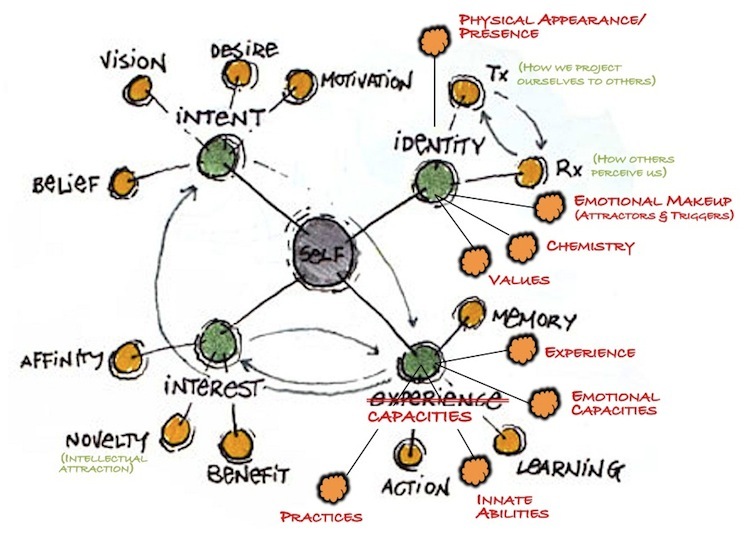 Memory, learning and actions all contribute to our capacities, and I think our experiences do as well, so I’ve moved experience to one of the orange circles connected to the renamed ‘capacities’ green circle. I’ve also added three other contributors to the ‘capacities’ aspect of our selves that I think Aaron missed, namely emotional capacities, innate abilities and practices. I think this change makes the model more complete and coherent. 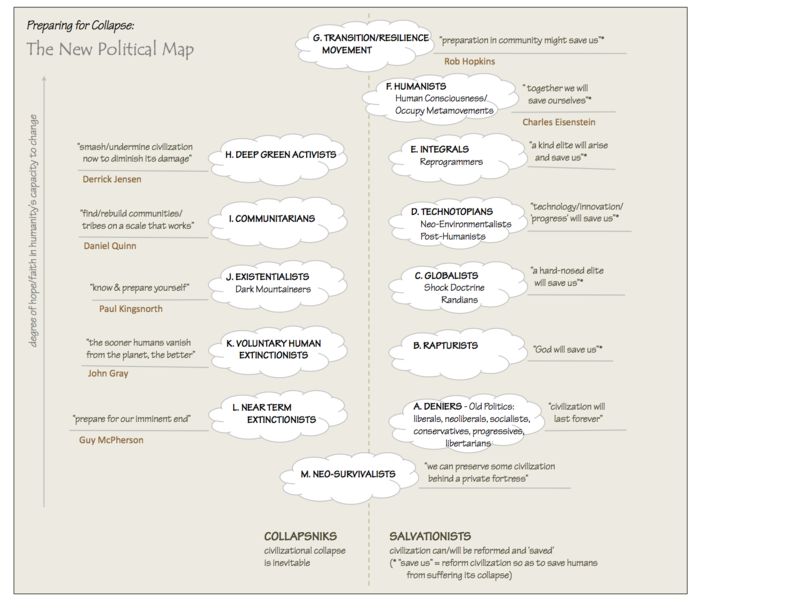 If the overlap is mainly common interests, it will emerge as a Community of Interest. Learning and recreational communities are often of this type. If the overlap is mainly common capacities, it will emerge as a Community of Practice. Co-workers, collaborators and alumni are often of this type. If the overlap is mainly common intent, it will emerge as a Movement. Project teams, ecovillages and activist groups are often of this type. If the overlap is mainly common identity, it will emerge as a Tribe. Partnerships, love/family relationships, gangs and cohabitants are often of this type. That’s about as far as Aaron has taken the model publicly so far. When I worked as a consultant I was required to claim I could help clients ‘create community’ or ‘create culture’. Now I’m older and retired and can recognize this as pure hubris. You cannot create community, all you can do is try to create or influence conditions in such a way that the community self-creates (self-forms, self-organizes and self-manages) in a healthier, more self-sustainable and resilient way. Much of the work of the Transition Network, and the sister Resilience Circles network, is about doing just that. Probably the greatest challenge to doing this is that you can’t, generally, compel anyone to be in a particular community, or exclude anyone who meets qualifying criteria from joining one. Executives can try to seed committees and groups with people they think are best suited to a particular task or role, but they can’t make them act as real communities unless the members themselves want to do so, and whether they will choose to do so depends largely on the uncontrollable overlaps and conflicts of all the factors in Aaron’s model. If the chemistry is bad, or their values irreconcilable, a group of people will act dysfunctionally no matter how theoretically well-suited they might appear to the person trying to get them into community together. If you really want to help a community succeed, you’re stuck with the people who self-select into it, including some you wish weren’t there and excluding others you’d really like to have join. There’s a controversial principle in Open Space events that “Whoever shows up are the right people.” The best way to influence who shows up is to research who you’d like to include and then craft an invitation to the desired potential members of the community that is specifically written to make it impossible for them to resist. But even then, if they show up and get confronted by some badly-behaved person you hoped would not show up, your work could be for nothing and the community could quickly self-destruct. Once the community has initially self-selected, the best way you can intervene to make it more effective and connected is through facilitation of their collective processes. That’s one of the reason’s I’m so proud of Group Works, the card deck of ‘patterns of excellent facilitation’ that I was involved (with many others) in creating, since it’s a tool that can help facilitators do this work more effectively. Facilitation includes helping communities reach consensus, resolve conflicts, identify shared visions and values, build affinity and capacity, create a shared, safe space for collaboration and decision-making, and achieve their intentions. So it has an impact on increasing overlaps and minimizing dissonance in all four of the aspects of self in Aaron’s model. So, Invitation and Facilitation are critical means of helping communities to get established and to thrive once they do. A third means is Capacity Building. Not everyone has to learn all the essential capacities of a self-sufficient, empowered community. Instead, members need to identify and acknowledge their individual and collective capacities, and the collective gaps, and develop a means to trust and empower those with recognized capacities to do what they do best, and to develop new capacities that fill essential gaps in the community as a whole. Related to capacity building is helping to create and evolve Effective Processes that the community agrees to follow to perform essential collective functions. There are five capacities that I believe everyone in a community should acquire: Self-Knowledge, Self-Awareness, Self-Caring, Attention and Appreciation. Yet these capacities are, in my experience, scarce, even in fairly mature and well-functioning communities, and their absence is one of the main reasons for conflicts in many communities, including conflicts that break up the community. We would all be better off, I think, if we spent less time trying to ‘self-improve’ and persuade, and more trying to ‘self-accept’, ‘self-understand’, ‘self-manage’, and really listen and understand others. I have no idea how we might accomplish this; it’s taken me a lifetime to become modestly competent at these and I’m still working on it. All told, that’s nine essential qualities (or perhaps ‘patterns’, if we use pattern language terminology) of effective community formation and sustenance. I’m sure there are many more. That’s my contribution to the first part of Aaron’s model. I’m looking forward to seeing and contributing to it as he develops it further, and would welcome your thoughts on it — its integrity, coherence and usefulness, and how it might be employed to help communities work and play and live together better. Pingback: What to put in a KM training, off the random top of my head | Agile KM for me… and you? this is the best piece of work on community business that I have seen. It also says my model is in looking in the right direction. If you include platforms you create sustainable foundations. Keep us posted. Kewl stuff, guys! Keep it comin’! Plus, I’m especially interested in the relations (arrows) between these aspects…how intention shapes capacities, for example. And, then, how these inter/personal dynamics swirl within the network-driven Community sphere (http://kauaian.net/images/3spheres.jpg) where ‘threats/opportunities’ interact with ‘trust/initiative’ to shape a particular community’s resilience…where ‘safeguard cohesion’ is the system imperative. And certainly one that could help express the story of the commons as system generative of livelihood and thrivability in all the manifestations it takes on the ground. Connecting communities is critical if we want our disparate efforts to coalesce. But how can these effort coalesce with no central direction or shared vision? I’ve been bouncing back on Ann Pendleton Jullian’s suggestion for a scaffold to aggregate different kinds of powers and mechanisms that are out there, and support the emergence of the new until it becomes strong enough; something strategically ambiguous towards which to head despite our differences, and that would aggregate coherence from a variety of disparate micro narratives that shape events and build trust at the grassroots level. And I am looking into the commons as system generative of livelihood and thrivability as scaffold. Though it can provide an underlying principle or logic that could federate efforts if brought to awareness, such generative system is ‘manifested’ in different ways in the perspective taken, intention, practices and capabilities on the ground. Thanks Helene, for your comments and your work on commons. I wonder if the commons, and community, are generative phenomena or emergent ones? I’ve had a lot of debate with people who live in community about whether one can ‘create’ community or simply draw on the conditions that give rise to it. That’s why I like this model so much — its purpose is to describe these conditions rather than trying to create them. Complex systems cannot be fully understood or deliberately ‘changed’ — all we can do is intervene intelligently and hope those interventions help rather than hurt, and adapt to the outcomes of these systems rather than trying to control them.